(CNSNews.com) – Rep. Seth Moulton (D-Mass. ), vice chairman of the House Budget Committee, said Tuesday that the $1.9 trillion that President Donald Trump has added to the budget deficit through the tax cut law is enough to pay for 220 border walls. 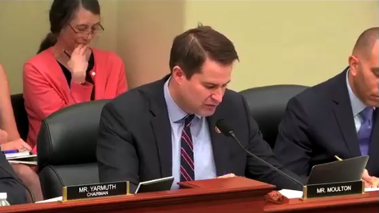 During a House Budget Committee, Moulton questioned acting White House Budget Director Russell Vought on the federal deficit and the effects of the Republican tax law. “I want to share a quote from a prominent politician who talked about endless deficits and said that they would ‘weigh the country down like an anchor” and that ‘we are on the verge of a debt crisis.’ Do you know who said that? It was Speaker Paul Ryan. In 2013, he was commenting on the Obama administration in the midst of the fourth straight year of reducing the federal deficit as a percentage of GDP. In reality, how much have the deficits and the debt exploded due to the Republican tax law?” Moulton asked. MOULTON: You believe that deficits will improve? That’s interesting, because OMB has consistently revised up its estimates since the tax law has passed for how big the deficits will be. Is that true? MOULTON: Is that true that you have revised up your deficit estimate since the tax law was passed? MOULTON: So they’ve been revised up, is that correct? MOULTON: Yes, they’ve been revised up. Thank you. So $1.9 trillion is the estimate that we have over 10 years. That’s the estimate that you’ve produced. I’m just curious. How many of Mr. Trump’s $8.6 billion walls could he build with $1.9 trillion? VOUGHT: I haven’t done the math on that, sir.